Hiya everyone, here is my bookcase (alas I only have one) and this means that unfortunately some books are covered up as they are double stacked. Anyhoo – apologies in advance for the quality of photo taking and any mess which might have crept in without my knowledge! At the top is what I have room for of my ornament and candle collection (my Gran used to collect ornate candles and it rubbed off on me) – the rabbit in the middle slightly to the back is my favourite!). 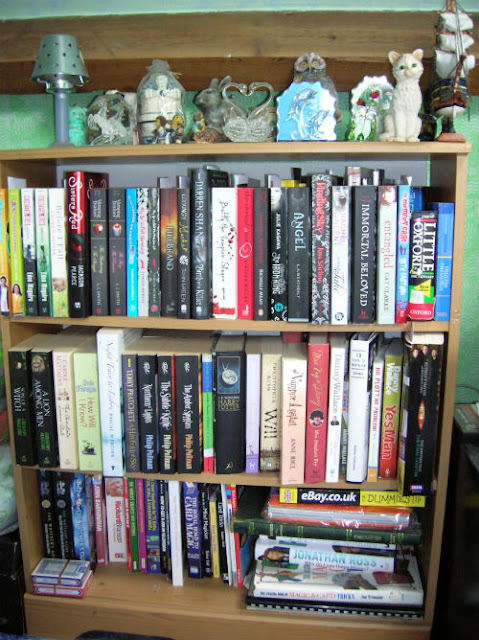 Moving on, the top shelf is where some of my YA books that I've read live – in here I try to keep all the series that I have together (my multi cover Twilight series is on the this shelf all be it hidden). To the right is a few writing reference books. The bottom shelf is where my non-fiction and biographies live (or as I like to call it books that won't fit anywhere else). On the left are the Buffy Watchers Guides. This shelf also contains more than a few magic and card magic books for when I went through my magic phase. If anyone wants an amazing introduction to card magic you can't go wrong with The Royal Road To Card Magic. 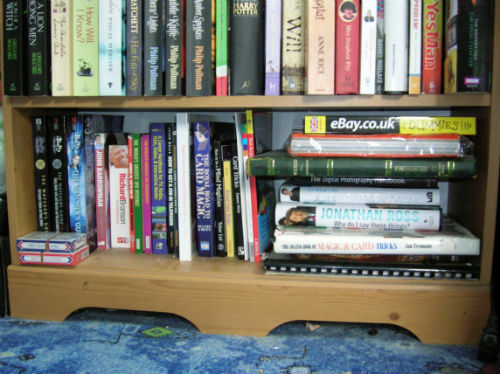 And lets not forget the Wicked Grimmerie and the Avenue Q companion book which also live on this shelf. 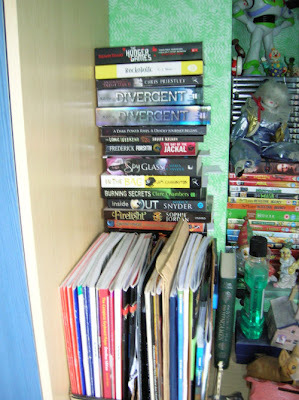 The remaining books which I've read go on this pile behind my music books. You can also see part of my brother's DVD and Clown collection here. And finally my TBR pile which sits next to my bed - as a rule when the pile hits the ceiling I stop buying books. 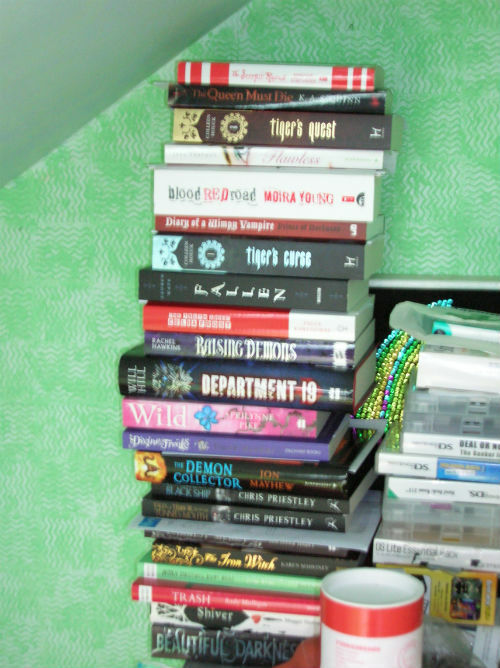 It's not really in any specific order, it contains a mix of books that I've bought, been gifted or have for review. I love all the ornaments at the top! I love the rule you have for your tbr! 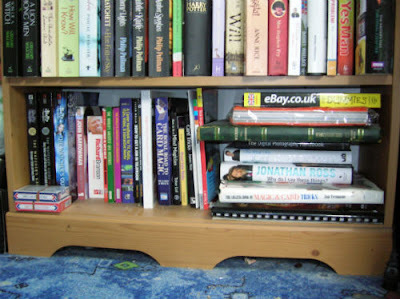 Great pics, I love getting to have a nosey around other people's book shelves :o) I love the idea of not buying books when your to read pile hits the ceiling - I must put myself on a major book buying ban!